Proust’s involuntary recollection of past events when he bit into the madeleine cake is one of the most dramatic and visceral accounts of how a bite can unleash a flood of memories. And as Proust writes, it was not the sight but the taste of the madeleine that was responsible for his cathartic experience. Taste and flavor touch us on a deep level. It is not surprising then that wars have been fought and lives have been lost in the quest for spices and exotic ingredients. In her new book, “Fragrant: The Secret Life of Scent,” renowned natural perfumer Mandy Aftel delves into the history of spices, herbs, and other exotic ingredients that have shaped the world as we know it. She has chosen cinnamon, mint, frankincense, ambergris, and jasmine as her five protagonists in the dramatic play for world power, perfume, as well as the conquest of the taste buds. Her writing is evocative and, just like her subject matter, also subjective and emotional. The book is sprinkled with myths and legends among the historical accounts that make this literary journey into the world of fragrance so enjoyable. Just in case one isn’t clear on what the act of smelling entails exactly, Aftel points out that, unlike sight and sound that can describe an object, smell does quite a lot more. The book is just as much about flavors used in food as it is about perfumes. And, as an avid collector of old books, Aftel brings to light some secret recipes that she has rediscovered through her research. It turns out that we modern people are fairly meek when it comes to spicing and flavoring our foods. As far back as Roman times and through the Renaissance, people used very strong flavors in cooking. And it wasn’t because they were trying to preserve meat. Salt curing, smoking, and pickling were already well-known methods for preserving meat. Aftel writes that, in fact, people ate spicy foods simply because they enjoyed the taste. European cookbooks from the 13th to the 15th century are a testimony to how much people loved spices and how valuable they were. According to Aftel, spices appear in 75 percent of the recipes. Records dating back to 1418 show that in England just over one pound of ginger would have cost as much as a sheep. No banquet was considered complete without dishes that were copiously seasoned with cinnamon, black pepper, ginger, and saffron. And if you’re wondering how the classic gingerbread man came to be, it appears that it might have been Queen Elizabeth who ordered small ginger-flavored cakes to be made in the shape of her noblemen. Aftel dedicates a whole chapter to cinnamon which she calls the “titan” of the spice trade—and rightfully so; it has been used throughout history and in so many ways. Egyptians used it in mummification, Greeks and Romans used it in religious rites, to create aromatic smoke—burning it like incense. “Cinnamon is a particular pleasure to use in creating flavor, because behind that big warm smile lies a wealth of nuance that embraces both sweet and savory. You might think of cinnamon as a reconciliation of opposites: sweet yet earthy, exotic yet comforting,” writes Aftel. The book also includes an old Coca Cola recipe that would be easy and fun to try to recreate, albeit without the ingredient that made it addictive—cocaine. Aftel’s research reveals that originally it was a pharmacy formulation to treat dyspepsia and headaches. If spices evoked far-away places, mint brought to mind “There’s no place like home—the name of the mint chapter in the book. Easy to grow, mint was the ubiquitous cure-all on all continents for many centuries. It seems to have been the stuff of legends as well. One of the most charming stories in the book is the fable related by Ovid in which Zeus and Hermes come down from Mount Olympus disguised as peasants and ask around for food and shelter. They are turned away by wealthy households but finally find shelter in the humble house of Baucis and Philemon—an old married couple. Before serving a humble dinner to their guests, the wooden table is first rubbed with crushed mint leaves. To make a long story short, in recompense for having sheltered the two deities, the old couple are saved from drowning in the floods that followed, sweeping away the other lavish houses. It pays to be hospitable, and fragrant. Mint was also the all-American flavor especially after William Wrigley Jr. added chewing gum to his wares that were initially just soap and baking powder. Aftel recounts how by 1910 Wrigley’s Spearmint gum had become the national favorite, followed by Doublemint. Colgate and Pepsodent then jumped on the mint bandwagon and the popularity of mint never looked back. History buffs will know that boredom was the affliction of the nobility for the most part of human civilization, for only a noble person could afford to entertain such thoughts. The less fortunate passed time in increments of pain and toil for their daily bread, and something to go with it. The nobility were fond of entertainment and intrigue. They coveted all that was rare and awe inspiring. Aftel points out that the Wunderkammen (chamber of wonders) were the forerunners of our natural history museums. And the most intriguing objects were inadvertently those derived from animals. Chapter five is the Wunderkammen of the book as in it Aftel explores ambergris and other animal ingredients that continue to fascinate us. Visitors to her studio always want to smell the animal essences first, and for this reason Aftel calls them “the rock stars” of the perfume world. At the top of the list is ambergris, which originates in the digestive tract of the sperm whale. It is expelled and floats around on the high seas until one day it reaches shore as a waxy substance that is the most highly prized perfumery ingredient. History reveals that ambergris was not only used for fragrance but for flavor as well. For non-perfumers and those who have no concept of the actual scent of ambergris, Aftel outlines the different grades of it and their corresponding aromas ranging from “dirtlike” to “ambery,” to “clean” and “beautiful”—though her description falls short of smelling the real thing. There are recorded recipes using ambergris, musk, and civet in a 17th-century cookbook, and Italian courtiers would sprinkle small pieces of it in tea or coffee. “…the court physician of Cosimo III de’ Medici was experimenting with new flavor combinations and aromatizing the grand duke’s chocolate with ambergris, musk, jasmine, and citron and lemon peel,” writes Aftel. The chapter deals with many animal derived essences and is full of fabulous tales. There are tidbits of information that are sure to make for interesting dinner conversation, even when the food has none of the curious ingredients derived from the excretory organs (or thereabouts) of some poor creature. If you didn’t know where viagra, the name, comes from, Aftel reveals that it is the Sanskrit word for the scent of the male tiger’s markings—so potent as to warrant a specific name all its own. You might feel like grabbing some cinnamon while reading Aftel’s book. No matter how evocative the writing, it all goes toward our olfactory education that is probably in need of adventure. It is clear that as a perfumer she hopes to change the way we perceive smell and the way we think of our foods and scents that we wear. It is also clear that no matter how hard we try to ignore scent, it doesn’t ignore us. Smells—good, bad, and the downright putrid are all around us and have the power to influence us on many levels. 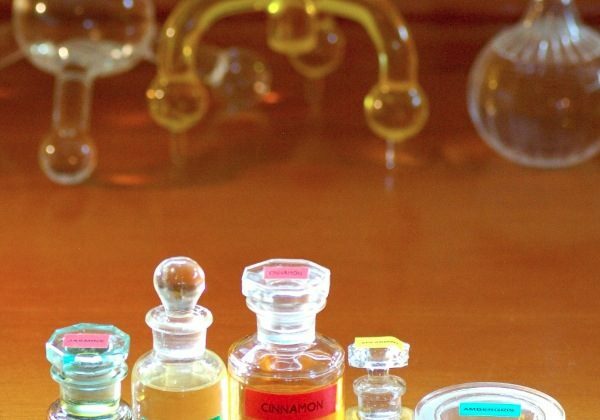 “Notwithstanding the inroads that scientific knowledge has made, scent remains one of the most accessible yet irreducible experiences of magic that we have,” writes Aftel. The book “Fragrant: The Secret Life of Scent” by Mandy Aftel will be published on Oct. 16. Aftel fans can order The Fragrant Companion Kit together with the book. It was created to allow the reader to “smell along” while reading about Aftel’s main characters—cinnamon, mint, frankincense, ambergris, and jasmine. Visit Aftelier.com for more information.